We are listed at the most famed DCV Lenses Manufacturers in India. The Bi-concave glass lenses are manufactured with both surfaces concave. These lenses have negative focal lengths. Double Concave Lenses diverge the collimated incident light and form virtual images, which are seen through the lens. 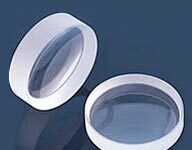 Double Concave Optical Lenses are often used to expand light or increase focal lengths in existing systems. They are used in laser beam expanders, optical character readers, viewers, and projection systems. Antireflection coatings can be ordered as an option.